Many college students are perplexed by their struggle with math. They know that they are good in reading and writing but have difficulty in passing math. What these students do not always realize is that it is possible to have a learning disability in math but not have one in reading and writing. The disability is called dyscalculia, and it is similar to dyslexia except the problems arise in math. These students often have difficulties with anything related with math. Most of them have been striving with math a long time. Students with a math disability often struggle with the visual steps as well as the auditory explanation of the processes. Someone who misreads and reverses numbers must remember to double-check work that has been copied to the paper. That same individual will often need to work through problems more than once or check the work on a calculator. The only way to find out if someone has a math disability is to get tested for a learning disability. The testing will often show problems with memory, visual processing, or auditory processing. It simply means the individual might have a problem following along with the class notes and lectures. 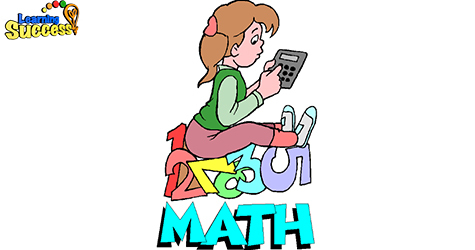 Testing may also show math reasoning, math calculation, and math fluency problems. If you're having problems with math, you may find the following strategies to be beneficial. First, take a very close look at your math book. Examine the way the chapters are presented. Look closely at each sample problem and match it to the same type of practice problem in the chapter exercises. Most of the time, the practice problems follow the same order as the sample problems. In addition, analyze at the answer key at the back of the book. Many text books have every other problem worked out in detail. Work through one of the completed problems and then repeat the steps with the “twin” problem that only has a final answer. Finally, work the problem out on a board and talk aloud to yourself as you do the problem. If you become your own teacher, and talk through the process aloud, this may help you remember those actions when you take your test.